These numbers that the Federal Reserve Board of Governors reported Monday afternoon are like a cold shower in consumer land where debt levels are considered to be in good shape. But wait… it gets complicated. In addition to its deposits, Wells Fargo lists $353 billion in other sources of funding – “short-term and long-term borrowing” – such as bonds it issued. For all sources of funding combined, so on the $1.73 trillion, the “total funding cost” was 0.87%. Nearly free money. Rate hikes no problem. In Q3, Wells Fargo’s credit-card balances outstanding carried an average interest rate of 12.77%! So, with its cost of funding at 0.87%, and the average interest rate of 12.77% on its credit card balances, Wells Fargo is making an interest margin on credit cards of 11.9 percentage points. In other words, this is an immensely profitable business – hence the incessant credit-card promos. With credit cards, the US banking system has split in two. The largest banks can offer the most attractive incentives on their credit cards (cash-back, miles, etc.) and thus attract the largest pool of applicants. Then they can reject those with higher credit risks – having not yet forgotten the lesson from the last debacle. The thousands of smaller banks cannot offer the same incentives and lack the marketing clout to attract this large pool of customers with good credit. So they market to customers with less stellar credit, or with subprime-rated credit — and charge higher interest rates. 30% sounds like a deal, even if the customer will eventually buckle under that interest rate and will have to default. That’s why banks take the risks of higher charge-offs: They’re getting paid for them! But at some point, it gets expensive. And if it takes a smaller bank to the brink, the FDIC might swoop in on a Friday evening and shut it down. No biggie. Happens routinely. The real problem with credit cards isn’t the banks – credit card debt is not big enough to topple the US banking system. It’s the consumers, and what it says about the health of consumers. The overall numbers give a falsely calming impression. 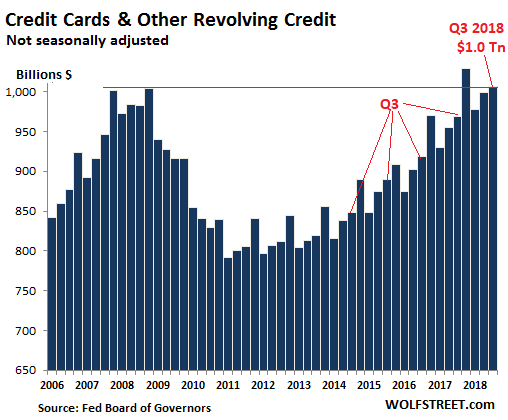 Credit card debt and other revolving credit has reached $1.0 trillion (not seasonally adjusted). This is about flat with the prior peak a decade ago. Since the prior peak of credit-card debt in 2008, the US population has grown by 20 million people, and there has been a decade of inflation and nominal wage increases, and so the overall credit card burden per capita is far lower today than it was in 2008 (though student loans and auto loans have shot through the roof). So no problem? But this overall data hides the extent to which the most vulnerable consumers are getting into trouble with their credit cards, having borrowed too much at usurious rates. They’ll never be able to pay off or even just service those balances. For them, there is only one way out – to default. The fact that this process is now taking on real momentum — as demonstrated by delinquency rates spiking at smaller banks — shows that the group of consumers that are falling apart is expanding. And these are still the good times, of low unemployment in a growing economy. The Council on Foreign Relations (CFR) a long established dyed in the wool establishment factor, has come out with “concern” over the Feds actions. I now removed the broken link. Sorry about the inoperable link. I wonder how much of this trend is geographic. The only people I know with smaller bank credit cards are from small podunk towns that will feel the liquidity crunch before the bubble zones. This trend is not geographic, they market to people around the country with bad credit. Usually the credit limit is very low like $500 and the interest rates are 25-30%. I still get offers from banks in flyover country I never heard of before. So, in the end all of us subsidize this activity to some small degree. Just one more form of moral hazard. In our “benevolent” society – its everywhere. Only depositors get bailed out by the FDIC. Shareholders and creditors other than depositors are on their own. Generally, shareholders lose everything. Secured creditors get the collateral they may have. If the FDIC steps in early enough, the net amount it has to pay out can be fairly small. The FDIC is funded by fees that the banks pay. So in the normal course of business, a bank failure doesn’t involve taxpayer funds. However, during the Financial Crisis, there were a lot of failures, and some very big ones too, that the FDIC covered, and it received backing from the Treasury to do so. Actually, it does. Banks pay FDIC premiums out of interest income collected from borrowers (loans or securities), as it is their prime source of income. There is no way around the fact that the FDIC is a giant collective subsidy. It’s “insurance,” as its name says, just like your auto insurance is insurance. All insurance operates on the same basis, no matter who owns and operates the insurance. Yes, All costs for regulations, FDIC insurance, etc. are paid by bank customers. Interestly, FDIC insurance rates historically have been the same for the riskiest banks as the most conservative banks, so the riskiest banks have indeed been subsidized. FDIC insurance allowed the riskiest banks to gather deposits as cheaply as their less risky competitors. If the risky banks had paid “insurance” rates for deposits on a risk-adjusted basis, they would have been unable to compete. So FDIC insurance has served to promote more reckless bank managment … “Insurance” that actually promoted moral hazard. As you know, FDIC doesn’t insure shareholders. When deposit insurance kicks in, it’s after shareholders and some creditors got totally wiped out because the FDIC takes over the ownership of the bank and unwinds it. The fact that owners of the bank get wiped out should be the strongest incentive to keep the bank from taking too much risk. Alas, during the Financial Crisis, the OWNERS were bailed out by the Fed. That’s the real “moral hazard” — the idea that shareholders have some kind of insurance from the Fed. Only thing I would add is that bank management and bank shareholder interests are aligned to varying degrees at different banks. Bank management does not want to fail anymore than shareholders, but FDIC insurance allows relatively poor/riskiest bank managers to compete in deposit gathering. They could not do so if their risk of failure was properly priced into the insurance. Totally agree that the larger moral hazard is the bail out, but in the case of FDIC insurance, it actuallu increases the likelihood of bank failures. Goldman has FDIC insurance. It may be a collective subsidy with no premium paid by depositors. Similar the Feds imagined balance sheet, (no private bank would ever accept those liabilities without some benefit) which is just the UST placing assets off balance sheet. The macroeconomy is like a magician at a children’s birthday party. In the 1980s, during the savings and loan crisis, the FSLIC became insolvent. It was recapitalized with taxpayer money several times, with $15 billion in 1986 and $10.75 billion in 1987; however, by 1989 it was too insolvent to save. The Dodd-Frank Wall Street Reform and Consumer Protection Act changed the minimum deposit insurance reserve ratio to 1.35% from 1.15% and required the Federal Deposit Insurance Corporation (FDIC) to meet the increased reserve ratio by 2020. Great article! I didn’t know the banks get a cut of the razor swipe! I thought only pay pal, visa, and master card got it. Wow, it seems hard to loose for a Big Bank..plus i see an earnings report where they paid only 11 % and another 17%. The issuer, usually a bank gets the lion’s share of the swipe fees. The network (visa/mc) only gets a small portion, but still a lot since it is almost all transactions these days. Then the processor gets another small portion (these are companies you’ve never heard of in the case of smaller banks, bigger ones like Chase do their own processing) and then the issuer gets the rest out of which they pay rewards and any affiliate agreement fees such as to the airline they are partnered with. That’s a pretty good simple overview of what goes on. These transaction fees (click fees) are the only significant income stream on card accounts without a revolving balances. Keep in mind that if you pay your card balance in full each month, you are able to maintain a continuous interest free loan so these fees help fund the cost of the free loan, cost of fraud losses, operating expenses, etc. And nowadays most with decent credit are also getting rewards or miles of 1-2% as well. My AMEX card rebates 6% at grocery stores for example – easily $30-$40/month in free $. But it requires discipline to pay in full monthly. I’m not overly concerned about credit card debt. Over-all household debt to GDP (thus adjusting for inflation and population growth) sits at about 78% down considerably from almost 100% in 2008. That decline has been continuous, though more gradual recently, over the last 10 years. In addition revolving, housing related and auto debt make up a smaller portion of that debt while education related debt has increased in relative proportion. The large increase in student loan debt, per capita and adjust for inflation, is a much bigger problem, because it affects young people, severely constraining life choices, especially family formation and ability to seek economic opportunity, in turn adversely affecting child poverty and economic efficiency. It also magnifies the housing crisis affecting our coast economic centers because it affects the same demographic. I’d estimate that about 75% of my friends with SL debt are in forbearance, with no reasonable chance of paying-in-full before they die. The macro effects, as mentioned by earl d, are cascading. As i ask my older friend who mocks millenials and their student loan problems (“back in my day, i paid my way through college bartending walking uphills both ways in the snow”), who’s gonna buy your stock and house in 5-20 years when you’re ready to sell? You are right about that. As the Boomers like me cash out of the market to use the money for retirement living expenses, There will be a lot of downward pressure on the market. Likewise in housing. Empty-nesters downsizing on a large scale lowers prices, too. If there next generation is broke, this will cause an epic stock and real estate market crash. I saw this all coming in the Eighties. In 1955, there were not enough grammar schools because of the Baby Boom. That got fixed. Nobody looked ahead far enough to see shortages in middle and high schools. Then there were not enough starter homes for the young couples. The country was caught off guard by the Boomer Tsunami. The reverse is now happening. You can’t fight demographics. “You can’t fight demographics.” – True enough. You can’t fight the demographics of the existing population. However, you can fight with immigration. @ earl d Good analysis/points. Student debt is bigger than card debt and auto loan debt, which is a relatively recent phenomenon. Nobody seems to understand or want to talk about how it is impacting other lending categories, household formation, other consumer behaviors, consumption etc. The huge amount of student debt will play big in 2020 …lots of votes can be bought with promises of $1-2 trillion in student loan debt relief. The banks have been giving out the credit card lines, but consumers have been reluctant to run up their balances in this cycle. The utilization of the available lines is way down relative to historical norms. 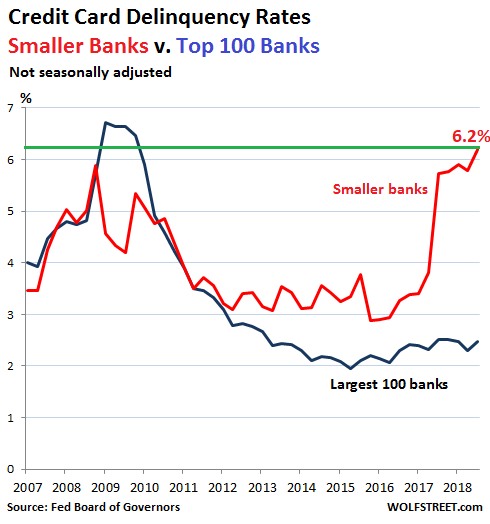 Delinquency and losses are also well below historical norms, though these small bank credit card delinquencies are indeed quite high. I do think there are probably some small banks that specialize in sub-prime skewing the %s and possibly great incidence of adverse selection for the others. Student loans may nominally be high but little of it will be paid back. The banks don’t care because student loans are backed by the tax payer. The ultimate irony is if you work for the government or non-profits for x years all is forgiven. On paper. In reality something like 1% of people working for the guv and nonprofits make it through that “forgiveness” gauntlet of red tape and fine print. Also there is no such a thing as low debt in the US, in fact the country keeps getting more and more and more in debt to the point some people think that’s just business as usual. ->So what’s going on here? The cracks are widening. Debt is becoming unserviceable. A Minsky moment approaches. Just a few more dominoes. I expect the Minsky moment occurs within three years. You either have debts that cannot be serviced (if the Fed stays strong) or you have pension funds that go belly up (if the Fed continues financial repression). Either way, there going to be a rash of bailouts and write-offs. leading to a deep recession. Too many people are owed too much money. Not all of the are going to get paid back. PS I wake up with the same serene smile I went to bed with. Not a worry in the wide World. What a difference a continent can make. In the EU, average folks can not charge goods above a certain amount. If you try that, your bank phones you ASAP. I’m guessing, Americans are allowed extravagent credit charges because the US $$ is *the* hegemonic currency. I’d like “to stand corrected” by this perspective. Thank you, Wolff for being far more grounded than others in financial matters. It might be a difference of the differences in regulation, Rubicon. For example, by law, most student loan debt can’t be discharged in bankruptcy. Another example: A law passed in 2005 says a borrower can be forced to repay some credit card debt, even after going through bankruptcy. Cars are a special case. Most people depend on their cars to get to work. Thus, they’ll pay their car note before rent, food, etc. You can live in your car, but you can’t drive your house. Just wait until they start coming after your heirs and relatives for debt. It’s been done. And there are lobbyists trying to pass it. I think the Feds can do this already? Student loan debt can’t be discharged in bankruptcy until the rules are changed by legislation or executive order. I would expect the student loan debtors to be bailed out at some point by a change in the rules. The law of contracts also is not sacrosanct as one would think. The Gold Reserve Act of 1934, among other things, abrogated the gold clauses in both government and private contracts. This unconstitutional legislation was affirmed 5-4 by the Supreme Court. When there are far more debtors with their backs against the wall, and when the largest debtor is the government itself, the problem will ultimately be addressed through currency devaluation. Is there any way to calculate Wells Fargo median margin on issued credit cards? Average rates do not reflect the real rate of return to the bank. Not sure about Wells, but a 2-3% return on assets would be considered very profitable versus about 1/2 that for other less risky bank lending businesses. In Q3, it carried an “average balance” of $36.42 billion in credit card loans on its books. WF says that these credit card loans earned $3.47 billion in interest. My calculator says that this represents an effective interest rate of 9.5% on all those balances combined. Now subtract the cost of funding to get interest margin. Banks give you “average” balances because they’re required to report that. “Average” in this context for banks means the average balance spread over the quarter, as opposed to the balance at the end of the last day of the quarter, which banks also report for various items. Compare that 3.45% overall net interest margin (which includes credit cards) to the WF margin on just credit cards. Credit cards are just super profitable. Careful, profit is not the same as margin. Credit Cards are a strong REVENUE source (even net revenue after cost of funds), but they also come with profit-sapping costs, including expenses for dealing with fraud, billing and collections, customer claims, those 1-2% rewards programs, and so on… No doubt still a good business, but maybe only until the cardholders go belly-up. 30 years ago when my wife was at Uni, a large financial institution (am expressly forbidden to name same) offered students FREE annual card fees…. for LIFE! As well as attached card. Over the years they employed several subterfuges to change to a different card/offer which, when reading the fine print, nullified that offer. Thanks but no thanks. I suspect a meaningful percentage of the bottom decile in terms of creditworthiness of card holders who default do so on a repetitive basis. The bank freezes their account ,for non-payment, they then settle for a small percentage of the unpaid principal and the borrower is told he will not be able to get a new card for two to three years. (Often the borrower can get a new card in as little as 6 months, generally from a different bank)….. And then the process starts over again. What with fees, penalties, 30%+ interest, and creative accounting by the lender it can be a satisfactory arrangement for both the lender and borrower. It used to be called usury. Basically, the “dead” consumer loans are auctioned off in tranches to someone like Experian for maybe cents on the dollar, then they chase down the deadbeats and see what they can get. So, My friend got called up by these people threatening him with court action and all manner of discomfort so he gets annoyed said: “you can get 2000 or you can go eff yourself and see what you get in court”! The caller, totally unperturbed, just said: “Ok, That’s a deal then, thank you sir. Have a pleasant evening”. At which point he realised that he probably could have paid less if he had realised that there was a negotiation going on. It is entertaining and well worth it to investigate how credit cards actually work. I doubt that anyone reading this blog will have to negotiate that payment. One crucial problem of deposit “insurance” is the fraudulent application of the honorific term “insurance” to schemes such as deposit guarantees. Genuine insurance gained its benevolent connotations in the public mind from the fact that, when applied properly, it works very well. Insurance properly applies to risks of future calamity that are not readily subject to the control of the individual beneficiary, and where the incidence can be predicted accurately in advance. “Insurable risks” are those where we can predict an incidence of calamities in large numbers, but not in individual cases: that is, we know nothing of the individual case except that he or it is a member of a certain class. Thus, we may be able to predict accurately how many people aged 65 will die within the next year. In that case, individuals aged 65 can pool annual premiums, with the pool of premiums being granted as benefits to the survivors of the unlucky deceased. The more, however, that may be known about the individual cases, the more these cases need to be segregated into separate classes. Thus, if men and women aged 65 have different average death rates, or those with different health conditions have varying death rates, they must be divided into separate classes. For if they are not, and say, the healthy and the diseased are forced into paying the same premiums in the name of egalitarianism, then what we have is no longer genuine life insurance but rather a coerced redistribution of income and wealth. Similarly, to be “insurable” the calamity has to be outside the control of the individual beneficiary; otherwise, we encounter the fatal flaw of “moral hazard,” which again takes the plan out of genuine insurance. Thus, if there is fire insurance in a certain city, based on the average incidence of fire in different kinds of buildings, but the insured are allowed to set the fires to collect the insurance without discovery or penalty, then again genuine insurance has given way to a redistributive racket. Similarly, in medicine, specific diseases such as appendicitis may be predictable in large classes and therefore genuinely insurable, but simply going to the doctor for a checkup or for vague ills is not insurable, since this action is totally under the control of the insured, and therefore cannot be predicted by insurance firms. But if no business firm can ever be “insured,” how much more is this true of a fractional-reserve bank! For the very essence of fractional-reserve banking is that the bank is inherently insolvent, and that its insolvency will be revealed as soon as the deluded public realizes what is going on, and insists on repossessing the money which it mistakenly thinks is being safeguarded in its trusted neighborhood bank. If no business firm can be insured, then an industry consisting of hundreds of insolvent firms is surely the last institution about which anyone can mention “insurance” with a straight face. “Deposit insurance” is simply a fraudulent racket, and a cruel one at that, since it may plunder the life savings and the money stock of the entire public. Basically the “fractional reserve…” concept has flaws- is what is being said, i.e. if there ever is a real bank run (large), the banks are not solvent. Then the whole idea of the definition of insurance kicks in- as does fiat money printing/backing. A well known bug/feature of the system. That does not mean that the essay proves or that these facts prove that fractional banking is “bad”. As with most things in life, it’s relative. The US economy wasn’t exactly the model of stability prior to 1900. Most people who advocate this stuff conveniently forget to check on that. Deposits in banks that are “too big to fail” will be promptly recapitalized with their unsecured debt. And… guess what? The largest chunk of unsecured debt is your bank deposits. Insolvent banks will recapitalize themselves by converting your deposits into worthless bank stock. This avoids taxpayer-funded bailouts that proved politically unpopular during the last financial crisis. Sure, in many countries your bank deposits are “insured.” In the US, the first $250,000 in your account qualifies for deposit insurance through the Federal Deposit Insurance Corporation (FDIC). But for every $100 on deposit, the FDIC has only $1.06 with which to back it. Doesn’t that make you feel warm and fuzzy about the safety of your bank deposits? That’s how insurance works. Any type of insurance. I’ve been involved in three collapsed banks (including the second biggest one that collapsed at the time) and have never lost a dime. Even during the big bad Financial Crisis, no FDIC-insured depositor lost a dime. No FDIC insured depositor has ever lost a dime. You’re worried about the wrong thing. An insurable risk is an event that is rare and will probably never happen. Your house burning down is a rare event. Your car getting stolen is a rare event. Getting sick is not a rare event, therefore not an insurable risk. What we have masquerading as health insurance are giant contingency funds that feed the healthcare industry instead of addressing the contingencies. I wish blogs could implement a schizophrenia filter…. Perhaps you should read the salient portions of the Dodd-Frank bill and then feel free to disbelieve your lying eyes…. That was then…and this is now. Dodd-Frank — even if it said anything to the effect of what you’re alluding to — is irrelevant for FDIC deposit insurance. If you stay within the FDIC rules, your FDIC-insured deposits remains FDIC-insured, period, no matter what the bank does or fails to do, or how it collapses, or what ever you want to read into Dodd-Frank. FDIC insurance is completely separate from Dodd-Frank. It’s just a waste of time to worry about it. now natural gas, that is something all together different, waiting for pullback for 5.50 spike.. There are 2 types of credit cards: business and personal. It could be that the credit card portfolio of the largest 100 banks is made up of more business cards. Businesses are more likely to bank at bigger banks and less likely to default on loans, while vice versa for individuals. BTW, if you have more cash than what you need immediately in a 0% checking account or anything at all in a 1% savings account, you are a fool. Wells Fargo preys on the ignorance of its depositors. So much panic.The Fed can print and make it all go away. dollar might sink for awhile but only for awhile. Credit cards are last century’s consumer credit business. The big banks know this, probably, and they extend credit on a handshake as it were. If your credit rating is good, you can borrow more money. The credit rating agencies are the new credit card companies. You don’t make money, you open new lines of credit. The point of CC debt is that it rises and falls according to economic conditions which depend on monetary policy, which is flawed. The point Wolf makes here is that CC debt is not as bad as 2008 but student and auto loans are pretty high, and those aren’t really monetary debt. Cars not since zero APR. Now its up to the deep state to keep track of who’s (credit) who, or allow neoliberal policy to project that responsibility to corporations. The insurance premiums are paid by the banks themselves. This sets up an interesting dynamic. When a bank fails, the surviving “healthy” banks are the ones paying for it through their premiums. But this makes the survivors less healthy. The insurance pool is going to have to be made larger. Which should lead to higher premiums making the survivors even less healthy. If the string of failures is lengthy enough the situation will lead to the banking system turning into the Donner Party. With net interest margin being as lucrative as it is, thankfully we are not yet at this point. The survivors are not less healthy, they are more healthy because they control a bigger piece of a smaller pie. They have more market share. Only the good deposits and loans are transferred by they FDIC to the new institution. The rest, the crap is resolved, sold off, written off, or litigated. The level of insurance premiums takes into account the value of the sold off, written off and litigation. If they did not then premiums are way too high. Overcharging banks for their insurance weakens the banking system. True, the survivors control a bigger piece of a smaller pie, but that only means the next failure will have an even larger impact. This also weakens the banking system.